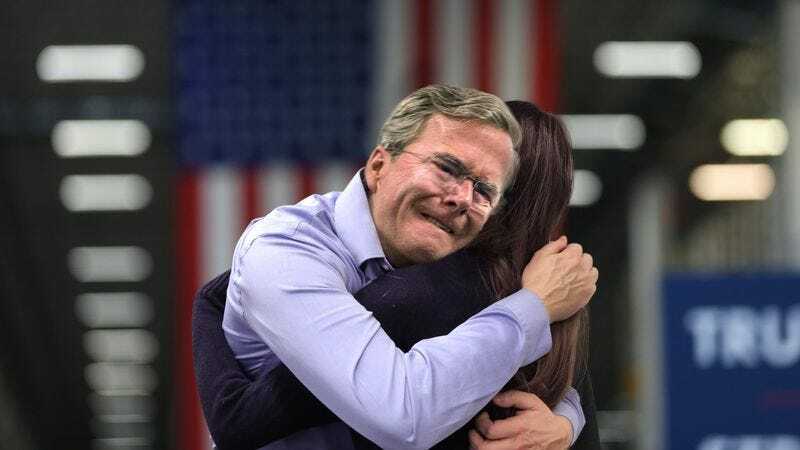 DES MOINES, IA—Slowly approaching the distraught, trembling presidential candidate before embracing him in a gentle hug, 42-year-old single mother Holly Sullivan comforted a sobbing Jeb Bush during a town hall forum, sources confirmed Friday. “It’s all going to be okay,” Sullivan said in a soothing voice after Bush broke down in tears while describing his executive experience, reportedly patting him on the back as he rested his head on her shoulder and told her that things were “too hard” and that he could not continue on like this anymore. “I know it looks bad, but you’re going to make it through this. You’re a brave man just for standing up and sharing your story like this.” Sources confirmed that sympathetic audience members then applauded Bush as he was escorted off the stage by his wife.